It's time for another Read Aloud Thursday over at Hope is in the Word! Some time ago I stumbled across the book What Do You Say, Dear? at our local used book store. It is subtitled, "A Book of Manners for All Occasions" and the idea behind it is completely adorable. 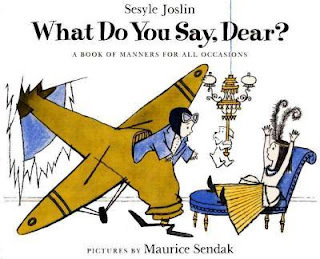 It looked like a totally FUN way to introduce a young kid to the concept of social graces. The book sets up ridiculously silly scenarios and then asks the child what they might suggest be done in these awkward situations. "You are downtown and there is a gentleman giving baby elephants to people. You want to take one home because you have always wanted a baby elephant, but first the gentleman introduces you to each other. What do you say, dear?" The answer is, of course: "How do you do?" And what if "[y]ou have gone downtown to do some shopping. You are walking backwards, becomes sometimes you like to, and you bump into a crocodile. What do you say, dear?" And so on and so forth. The pictures are funny and, of course, none of the situations have the slightest chance of happening to any of us, but the basics of courtesy are learned in a way that is a far cry from condescending and is, in my opinion, quite adorable. Then, given the above opinion I have just stated, you can imagine my delight when I came across the sequel, What Do You Do, Dear? which advises you as to proper conduct for all occasions. Let's say, "You are a brave knight and you are sitting at the round table with nothing to do because it is raining. Suddenly the Princess calls you up. 'Prithee, come rescue me," she says. "It is raining so hard that my castle is floating away." "What do you do, dear?" "Put on your rubbers before you go out in the rain." 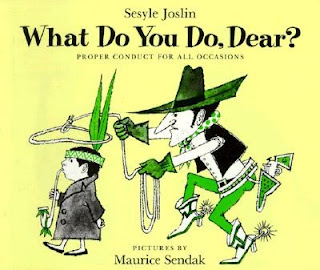 Written by Sesyle Joslin and illustrated by Maurice Sendak, these books were both originally published in 1958. What Do You Say, Dear? was the winner of a Caldecott medal in 1959 if that makes it even more tempting for you to check out a copy of the book. I love these books. I think they are slightly ahead of us concept wise but I pulled them out to read anyway, in light of Jennifer's Read Together Challenge. And mostly because I'm just impatient to get to them. In this case, Mommy is totally enthralled and hopes to make the offspring just as interested. Wish me luck, please and thank you! We could use some manners books around here! I linked you up at Read Aloud Thursday--I figure you're probably away from the computer now. These look great! I love the humor and the illustration look quite entertaining as well! Another addition to The List.